Have you ever noticed that parenting can feel a lot like dieting? Let me explain. I have the following items in my home: Dumbbells, jump ropes, stretch bands, workout clothes, various DVDs promising flat abs, shakes and blenders, at LEAST 15 diet books, yoga mat, and expired memberships to Barre, YMCA, etc. I have every tool that has been produced to help me lead a healthy lifestyle and lose that extra weight. And somehow, much like insanity, I keep doing the same unfruitful thing over and over again. My problem isn’t the amount of stuff or the lack of stuff. And it's not even the effectiveness of each tool. It’s me. I’ve never actually picked one of my awesome systems and stuck to it for more than two hours or three days. And, then there’s also the emotional factor of health - likely a deeper issue to it all. Let's solve my health issues another day. So, what does my health problems have to do with our parenting? We have never ever been more equipped to parent our children well. Even in the last five years, the market has exploded with resources. I started a small business just seven years ago with products for families because I was frustrated at what was missing. My motive was in the right place - I wanted to help families in the journey of faith. And make it easier! Now you can just walk into Hobby Lobby or log onto Etsy and it is overflowing with meaningful tools. Every day our social media feeds are filled with great ideas and printables and new genius products that are meaningful and helpful. How fantastic and how overwhelming - when you have little time and big dreams for your kids. Similar to dieting, my idea of parenting “well” has become a game of acquiring things and knowledge. As I walked around my house observing all my systems and books and stuff to parent well, I began to realize I was obsessed with the gathering. And I began to wonder if my effectiveness and purpose has gotten lost in the distraction of collecting and creating. In my attempt to control the outcome of my children, have I been caught in a sneaky web of systems? What would it look like if I just picked a tool or plan and stuck to it? What would it look like if I unclenched my fists from the steering wheel and let God drive? What if I leaned in closer to being vs doing? I believe this shift would allow the pressure to slowly lift off myself and my kids. I believe it would allow my kids more room to breathe and just be kids. And maybe not every moment has to be teachable or a lesson and definitely doesn't need to feel like a lecture. I believe the tools would be more joyful because we'd use them when the time is right because we can - not because we have to or should. So, this is the real question I must wrestle with. Do I trust God with my kids or am I trying with all my might to make sure they turn out just right? Am I confusing my role? For those creators of stuff out there that are wired like me, do not get discouraged. We need you and your brains to keep making practical resources. We just have to keep checking our motive and place. And never believe that our systems are higher or better than God's ultimate design. For Him to move in us and our kids' hearts. And never believe that the tool or system will ultimately be in control of what's ahead. God is GOD. He can use a song, a bird, a conversation, a book, a card and more. He can use anything in the world that He wants to move the heart of our kids. He can use us. He can use the tools. However, He doesn't need any of it. I never wanted people to fall in love with my scripture cards, I always wanted people to fall in love with God's word. • What systems or tools are NOT working? • What traditions or moments does my family enjoy? • What systems or traditions create real conversation about a real God? • Which items make my kids feel the pressure to perform like good little Christian kids? • What days/nights can I clear up for my kids to just be and play? • Which items feel like a chore and which items bring life? • Is there anything we are teaching that is just making us look good as parents vs impacting their hearts? No one gets into heaven for the number of scripture cards memorized or pieces of art on their wall. Use God's word to comfort and to encourage your kids to lean into a God that made them and loves them more than we do. What if I raised up kids with a HEAD FULL of virtuous knowledge, only to find out they left my home with an EMPTY HEART that never really knew God? Now, please don't go burn all your parenting and faith stuff, or feel pressured to buy any new stuff. Just pray. And seek Him. He will lead you all the way. Lord, I desperately love these kids and I want to raise up kids that love you with all their heart. And that know they are loved by you to the core. Help me remember that it’s not all up to me. I can trust you to guide me and give me wisdom and discernment. Help me to point them to you. Help me to show them you more than try to be you. Lord, show me which tools or resources have become unfruitful in our home. Help me to declutter our homes and hearts. Help me to find ways that work for our family and help me not to compare to others. We want to be different in the way we live. We want to be a family that shines your light through how we love others. Help my kids know my heart and love for you - more than know all the right things to say. We love you Lord. Amen. Courtney DeFeo is most known for being a factory of ideas for families. It’s her desire to lead a life that radiates God’s love in action and His grace along the way. 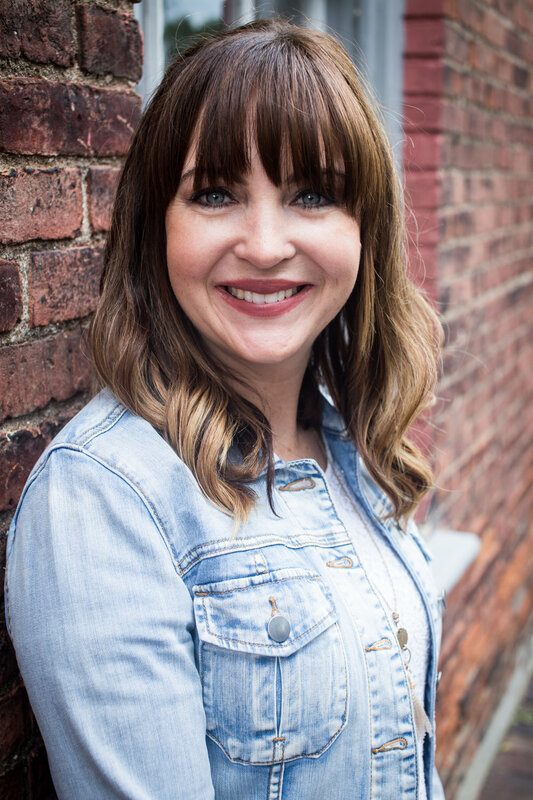 As a former marketing professional for corporations such as Chick-fil-A and Ketchum Public Relations, Courtney has a history of creating memorable programs and ideas that motivate others to action. She is the author of In This House, We Will Giggle, creator of ABC Scripture Cards and Virtue Cards and the kindness movement Light ‘Em Up Acts. Her latest project is a community for tween girls and their moms - found at TreasuredGirlz.com. Her house is a wreck and she hates to cook. She adores her hot, patient husband. Connect with Courtney at CourtneyDeFeo.com.